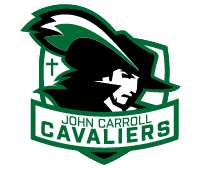 The John Carroll Booster Club supports athletic and academic excellence, helps promote sportsmanship and we seek to lend our time, talents and treasures to Athletic Director Ronald Steele and his team of coaches. We work closely with all the JC coaches to identify the short and long-term needs of their teams and to proactively work to assist in fulfilling those needs. We also participate in the long-term planning efforts of the athletics department - helping to ensure that the JC Athletics Department continues to grow and flourish into the future. Finally, our goal includes bringing the JC community of students, parents, families and alumni together in a fun, exciting and spirit-led environment. Memories are created, and lifelong friendships are forged as we come together to support the coaches and athletes at John Carroll. Win or lose, the JC Booster Club recognizes the inherent growth that comes through our collective efforts to overcome adversity, remain humble in prosperity and in building a foundation of hard work and confidence in our student-athletes. Qualities that will last long after our time here at John Carroll.